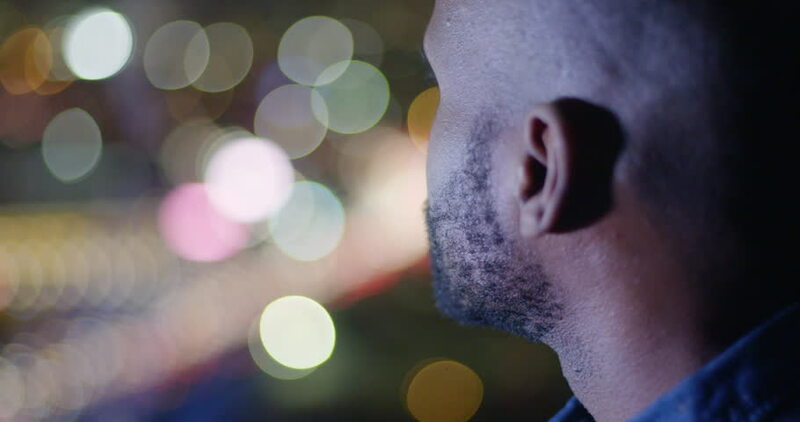 Dark skinned African American man looks out over city lights and freeway traffic from an apartment window high above Downtown Los Angeles at night. Focus on man's head. hd00:30Beautiful young woman decorating a Christmas tree for the celebration of Christmas. Face of a woman in the Christmas tree garland flashes. 4k00:08Focusing on santa claus Christmas and New Year Decoration. Abstract Blurred Bokeh Holiday Background. Blinking Garland. Christmas Tree Lights Twinkling. hd00:18Industrial Worker labourer at the factory welding steel structure with blurred motion.Bokeh from the light,Welding work.worker with protective mask welding metal at night. 4k00:13Handsome African American man looks past his reflection in window overlooking the Downtown Los Angeles skyline. Big close up, recorded in slow motion at 60fps. 4k00:19Dark skinned African American man sips from a wine glass in a window with city lights while looking out at Downtown Los Angeles at night. Medium close up, hand held. 4k00:11Silhouetted African American man looks out of window across the freeways around Downtown Los Angeles skyline at dusk. Medium shot, real time. 4k00:11Silhouetted African American man looks out of window across the freeways around Downtown Los Angeles skyline at dusk. Hand held big close up, recorded in slow motion. 4k00:11Beautiful young blonde woman and African American man ignore each other as they use their cellphones on sofa in Downtown Los Angeles apartment. Wide view with city buildings in background. 4k00:12African American man's hands holding a crystal ball in front of Downtown Los Angeles skyline. Big close up, recorded hand-held in real time. 4k00:20Beautiful young blonde woman and African American guy talk and laugh in Downtown Los Angeles venue at night. Mid shot with city buildings in background. 4k00:10Silhouetted African American man looks out of window at Downtown Los Angeles skyline at dusk. Hand held medium close up with with city buildings in background.